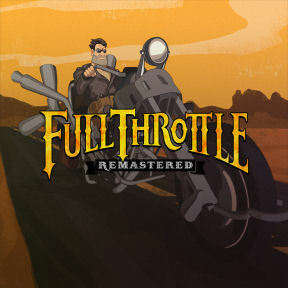 GameBoomers will be giving away 5 keys to a digital downloads of the game Full Throttle Remastered, courtesy of GOG. To enter the drawing, please post HERE first to say you are IN and send me an E-MAIL using my e-mail address in my profile. Please no PMs. Put the words "Full Throttle" in the e-mail subject line and include your GameBoomers MEMBER name in the body of the mail. Entries must be submitted by Monday the 20th of March 2017, at 9:00PM, Eastern Daylight Saving Time. The winners will be announced on the 20th of March also after 9:00PM. And do not forget to claim your prize in the next 72 hours following the announcement of the winners or a runner-up will be chosen. Keys will be delivered when the game is released on April 18th. Only one entry per registered member. A BIG thanks to GOG for making this Giveaway possible. GoG is open for PreOrders here with a special 20% off until the launch of the game on April 18th. Check out the sale of other Double Fine games on Gog here. Nice of GOG to do this. Thanks Chief and GoG! everyone! and thanks to you MaG and Ana. Awesome! I'm IN - thanks to Chief, Ana and DoubleFine! Please enter me in the contest - the original game was great! Thank you to all involved for this giveaway. And BIG thank you's to you Chief, to BrownEyedTigre and to GOG !! Last edited by Mad; 03/14/17 04:54 PM. Chief and Gog and everyone. Chief I am not entering just wishing everyone good luck. All emails IN up to now. I would like to have a chance to win too. I love these old games! I'd like to enter this also. I am IN! oldbroad, I did not get your e-mail. I sent it but I'll try again Chief. Last edited by Chief; 03/14/17 09:28 PM. You should have 2 emails from me now I think. I would like to try my luck. Please count me in!